The configuration file of the network devices needs to be backed up in a timely manner to ensure device security, reliability, and availability of services. In case of a fault occurs on a device, the backup configuration file can be restore to the device to quickly for the continuity of service. The configuration backup must be operated with secure protocol such as SFTP or SSH only. In this article we will do the configuration backup for a list of Cisco router/switch devices with Python script using SSH secure protocol on Linux server running CentOS7. There is a Linux server running CentOS7 and connected to Cisco router and switch. 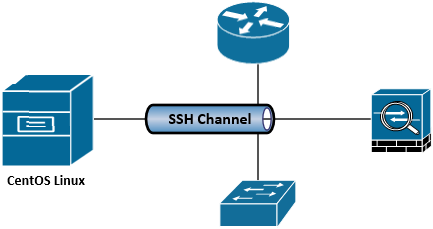 From Linux server we can remote SSH to both Cisco router and switch. You can download Python Backup script here Script_BackupConfig_CiscoRouterSwitch extract it and upload to CentOS7 Linux server. There are 2 files in. One is the script file and another one list of host to be backup by this script.You can create a directory any where and keep these 2 files together in the same directory. There are 2 files. One is the script file and another one is list of host to be backup by this script.You can create a directory any where and keep these 2 files together in the same directory. For our case now, let make directory /var/scripts/netbackup and keep this 2 files there. In this script will backup router and switch configuration directory /var/netbackup, so need to create this directory accordingly. You need to update USER, PASSWORD, and secret to your own username, password, and enable password. The script will do multiple devices backup from list of host in file cisco_routerswitch. So, we need to add Cisco router and switch hostname or IP address of remote SSH management into this file. Let use /etc/hosts to have a friendly name of backup file. By default after installing CentOS7 Linux OS, Python version 2.7.5 should be installed there. We can verify with the following command. To execute this Python script, we need to install the following Python module. Now, we should be able to run this Python backup script, but need to make this script executable with the following command. Let test run the script manually with the following commands. Then we need to verify to make sure that the script can backup the Cisco router and switch configuration successfully. Finally, It is time make a cronjob to run this script schedully. Let cronjon run this script everday at 21:00. That’s all about doing the configuration backup for a list of Cisco router/switch devices with Python script using SSH secure protocol on Linux server running CentOS7 from Tech Space KH. Hopefully, you can find this guide informative. If you have any questions or suggestions you can always leave your comments below. I will try all of my best to review and reply them.